How much does it cost to remove carpet? The national average cost of carpet removal is $200. Costs will vary based on how many square feet of carpet you want to removed and any special features the carpeted rooms have. It’s messy, heavy work, but professional can tear up and haul away the existing carpet along with tack strips, glue, and the stapled-down carpet padding originally used in the installation process. If you want new carpet, hardwood flooring, tile, or cement, you’ll need to have old carpet removed first. Many pro carpet removal also can help in carpet installation and other types of flooring. If replacing wall-to-wall carpet with new carpet from big-box stores or home improvement warehouses, removal of the old carpet will not always be included in the charge, so hiring a pro to handle it saves you time and hard labor. The national average cost of carpet removal is $200. Carpet removal is either priced by the hourly cost of labor to remove and dispose of the carpet and carpet pad, or by the square footage or square yardage of carpet to be removed. You can estimate the cost of removing carpet in your property by multiplying the number of square yards of the carpet by the price of removal per square yard. A standard fee for carpet removal and haul-away is $1 per square yard. Carpet removal professionals remove and dispose of wall-to-wall carpeting safely and efficiently so you don’t have to mess with it. Some professional charges $7 per step to remove carpet. Total project costs may increase for rooms with special features that require additional time, labor, or care. In addition, carpeted stairs will add to your carpet removal costs. There are additional carpet pad staples and tack strips that must be manually removed from each step, adding to the labor costs of the project. A pro may price each additional stair as an add-on to the cost, or they might roll that added labor into the total cost per square yard. Re coating hardwood floors simply includes adding an additional protective layer on top of the floor’s existing finish. Refinishing, however, involves sanding the floor’s current finish down to the original bare wood and then adding a protective layer. As with any home improvement project, the cost of refinishing hardwood floors varies based on location, floor material, floor condition and other factors. Professional carpet removal costs may be lower if you are having the same company install new flooring during the same project, so bundling services is a way to save. Provide as much information as possible upfront about your carpet removal, repair, or installation project to avoid surprise costs. Tackling carpet removal yourself is another way to save. Be prepared for some heavy lifting and dirty work. You’ll need a utility knife, pry bar, and well-rated dust mask to protect yourself from carpet fibers and dust. 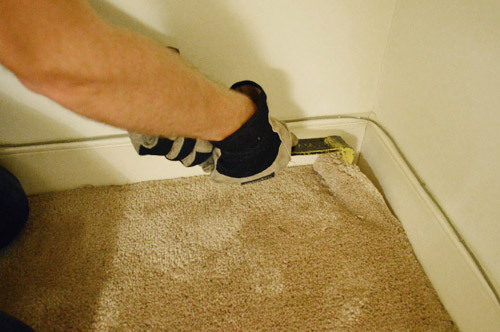 Removing old carpet can be a DIY project, if you have a safe and legal place for carpet disposal, the muscle power to carry the old carpet out, and the ability to remove all the old carpet pad staples, tack strips, and other old materials yourself.